Rovinj is considered by many to be one of the most beautiful and romantic Mediterranean cities. The boutique hotel is located next to the most beautiful bay in Rovinj, just off the city centre along the main coastal promenade. The leading Croatian tourist company has created a superior tourist area with hotels of various categories in the protected park forest Zlatni rt, where, besides the Monte Mulini, the design Hotel Lone, Hotel Eden and Hotel Grand Park, which opens its door in April, are located. Due to its exclusivity, the most prestigious Maistra hotel is included in the chain of The Leading Hotels of the World, which has been bringing together the world’s most luxurious hotels since 1928. It is known for a very strict entry bar and quality standard, and currently represents the 430 of the most luxurious hotels in the world. 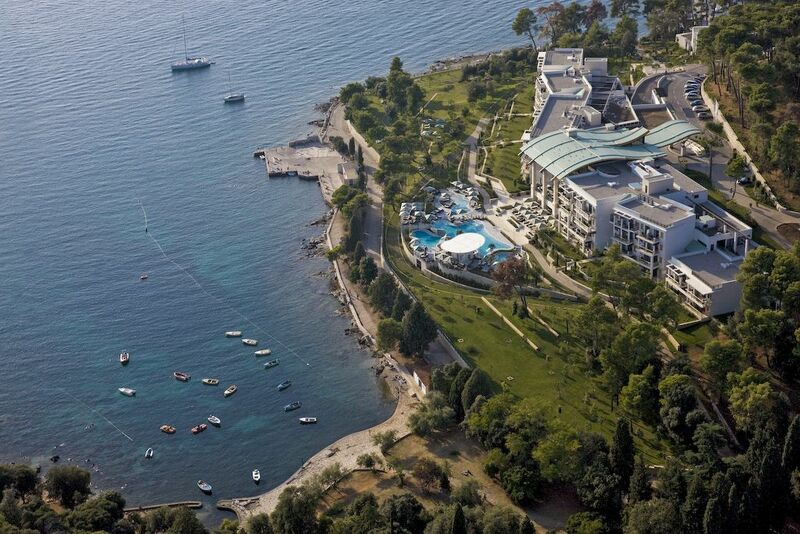 The hotel is located by the sea and is only 10 minutes’ walk away from Rovinj’s central town square. The walkway from the hotel to the city centre is well-maintained. Rovinj is considered one of the closest Mediterranean meetings destinations for the countries of Central and Western Europe, located in the most northern part of the Mediterranean. The main advantage is high-quality road connections. A bigger problem is aviation accessibility, which, in the context of the position of the six closest international airports, nevertheless improves yearly. For guests with cars, the hotel has a car park with an underground garage and outdoor parking spaces. The city and main attractions are at your fingertips, and the fastest way to explore the city is on foot or by bike. The architecture of the hotel is clean, modern and somewhat conservative. A tall lobby with a glass facade overlooking the bay stands out. Hotel designers from the famous British bureau Wimberly Allison Tong & Goo have bet on the tested model of creating luxurious hotels with a touch of prestige that they have already applied to many of the world’s top hotel chains. In practice this means a mighty lobby, spacious rooms and superb horticultural arrangement of the hotel’s surroundings. We do not have any comments on the appearance of the hotel. Quite different to attract and individual enough to be differentiated from the more ambitious designer hotel Lone. The properly set room’s interior significantly contributes to the pleasure, comfort, and well-being that one experiences while staying at the hotel. This is followed by staff who are at the highest level in terms of friendliness, professionalism and personal attitude towards guests. The most prestigious part of the hotel is the extraordinary gastronomic offer at the Wine Vault and Mediterraneo restaurants, in which the legendary Croatian chef Tomislav Gretić has set the trend. His successors are just as successful and many still come to Rovinj for the sake of top-class cuisine. The spirit of the French and the tradition of Mediterranean gastronomy is also present in great diverse breakfasts. We appreciate the seasonal adaptation of dishes and excellent local ingredients as well as Istrian dishes. The choice of dishes that you can order à la carte at breakfast is also exceptional. This is certainly one of the best breakfasts on the Adriatic. By the way, the wine shop still offers one of the largest collection of wines on the Adriatic. The hotel rooms are at the top, if not even at the very top of comfort, prestige and with the selection of pampering accessories. For a hotel of this category, it is expected that the hotel will provide accessories that make your stay pleasant and this hotel has certainly done so. The rooms are relatively classical, very elegant and timeless. Hotel Monte Mulini has two smaller, luxury meeting halls for receptions, banquets and other events for up to 250 participants. An integral part of the resort is the Monte Mulini Convention Centre, as they called all the capacities dispersed in the neighbouring hotels Lone and Eden. Together they combine 30 halls, of which the largest is in the Lone Hotel and accommodates over 700 participants. The supreme cuisine, which has been designed by Tomislav Gretić, for many the best Croatian chef, continues to attract real gourmets. This part of the offer is a great added value of the hotel. There are only a few trivialities that distract, like not always a super-fast internet connection. Otherwise, it is an exceptional hotel, where there is hardly anything to complain about. Free bike rental for hotel guests. The hotel was last evaluated in 2013 and after this visit we can conclude that it is ageing similarly to a top-quality wine. This is still a hotel to enjoy, to which the whole business philosophy is subordinated. There are only a few hotels that impress as the Monte Mulini Hotel does. The hotel looks good, is excellently equipped and exceeds expectations in many ways. The longer we stayed in the hotel, the better the feeling was that it is an exceptional gastronomical oasis. Superior staff, quality content and ingredients and a personal approach remain the core of the story. This five-star hotel will get competition this year on its own doorstep and in its own premises. The nearby Grand Park Hotel is supposed to be even better. Due to Monte Mulini Hotel and the Lone congress centre, Rovinj is able to host the most demanding and exclusive congress events. SPECIALS Chef’s table can be a unique experience for a smaller, intimate group of people or a top incentive story. You will experience everything that happens behind the closed doors of the Wine Vault Restaurant. A table for up to 6 people is a true paradise for all gourmets.